Insert the key, turn, and the door opens. It’s expected and works over and over again without issue. Though, did you know that lock manufacturer recommend that locks be maintained and cleaned on a regular basis in order to last as long as they can and not fail to lock or unlock when you need it to function properly? Don’t be surprised if you were unaware, because it is not something most of us think about every day. Your locks are there to keep trespassers and would-be burglars out of your property. Because locks are your first line of defense, it’s imperative for the sake of safety and peace of mind that all of your locks are functioning as intended, working well to keep you safe. Maintaining your locks not only give you a confident level of security but also save money in the long run that you would spend on expensive locks changes that may have been unnecessary if the lock had simply been properly cared for and maintained. 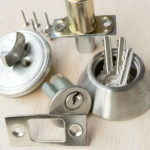 Knowledgeable locksmiths share some expert tips and advice on how to properly maintain your locks by keeping them clean, lubricated as well as some helpful information you may have never considered. Locks have intricate, moving parts that make it work as it should. It is necessary to keep these parts free of friction so they turn and work like they are supposed to in locking or unlocking. The lubricant helps to keep the lock from jamming or sticking and also wards off the onset of rusting which happens quicker when the lock is exposed to outdoor elements of extreme weather conditions. Experts recommend that you lubricate your locks at least once a year and preferably once every few months. The brand of the lubricant you choose could make a difference as well. Many locksmiths recommend WD-40, though some suggest a product called Tri-Flow is even better, as it uses less harsh and harmful chemicals. As with most objects, keeping them clean often expands their life and usefulness. Locks are no exception. It’s important to keep them clean. When it comes to locks, there are two parts: The exterior which can easily be wiped down with a non-abrasive cleaner or a damp cloth and mild dish detergent, and the interior intricate moving parts. The interior is a bit trickier to keep clean, mostly because you cannot see it. Deadbolts add an extra measure of security to your house when the lock is functioning properly. When you routinely clean your locks, make sure that the deadbolt is not showing signs of wear and that it has enough space to extend and retract fully. Keys and locks are designed to work together. If one is in good condition, the other will be less likely to wear out as fast. Likewise, if one component is wearing out, the other will also begin to fail. Usually, it’s the key that begins to show signs of wear before you notice a malfunctioning lock. A hidden secret that professional locksmiths know about is that one way to keep a lock working properly is to have a new key cut for use in the lock. Once you have a new key, swap out the old one and begin using the freshly cut key.